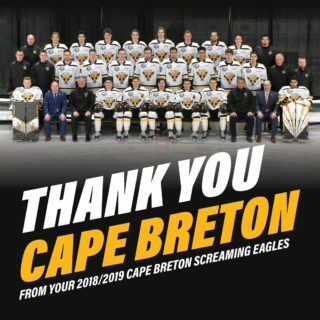 SYDNEY- This time, the Screaming Eagles comeback against the Moncton Wildcats wouldn’t be denied as the Eagles edged the Wildcats 3-2 in a shootout. 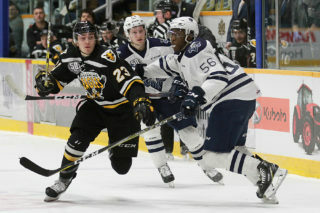 Having come back from 3-0 to defeat Moncton 4-3 on December 28th, and coming back from 3-0 only to lose 4-3 this past Wednesday, clawing back against the Wildcats was not unchartered territory for the Eagles. The visitors struck first on a shorthanded goal by Dylan Seitz in the opening frame. Eagles netminder Kevin Mandolese made the initial save but left the rebound open and Seitz put it over the goal line and it was a 1-0 Moncton lead after 20 minutes. The lead would double for the Wildcats early in the second period, as Alexander Khovanov received a pass while setting a screen. He spun around and put it by Mandolese to make it a 2-0 game, a score that would hold through until the next buzzer and eight minutes into the third period. Brooklyn Kalmikov, who scored twice in Wednesday’s win in Moncton, kickstarted the comeback at 8:40 with a riffle of a shot over Francis Leclerc. While the Eagles continued the pressure- they outshot Moncton 13-0 in the third period- the comeback hopes took a hit when Leon Gawanke was whistled for delay of game with with 3:27 to play in the third period. After killing the first 80 seconds of the penalty off, the Eagles were given a lifeline when Moncton’s Christian Huntley played the puck when there were six Cats players on the ice. He’d serve the penalty and the teams would play four on four. Following Gawanke’s penalty there was 1:27 remaining, and not long after Eagles coach Marc-André Dumont elected to lift Mandolese for the extra attacker. With time ticking down and the penalty to Moncton just having elapsed, Mathias Laferrière threw a shot off the left boards on net. 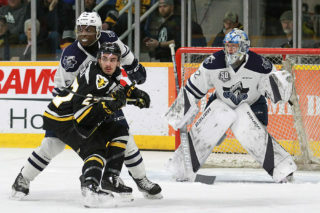 With Derek Gentile running a screen it snuck through and the game would head to overtime as Laferrière tied the contest with less than seven seconds left. Cape Breton’s Gabriel Proulx would take a penalty for a faceoff infraction at centre ice following the goal, and the Eagles spent the majority of the first two minutes of overtime on the penalty kill. 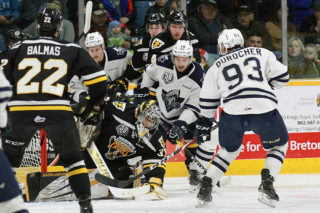 Moncton could not find a power play goal, and the two teams would manage only four shots in the extra session and the game headed to a shootout. The Eagles elected to shoot first, and both Cape Breton’s Egor Sokolov and Moncton’s Jeremy McKenna succeeded in tinging the twine. After Gentile and Khovanov failed to score, the third round was essentially a sudden death round. Mitchell Balmas outwaited Leclerc, lighting the red light and putting the Eagles in the driver’s seat to win- a victory that was secured when Mandolese denied Jakob Pelletier. Mandolese picked up the win, stopping 15 of 17 shots. Leclerc took the loss, turning aside 36 of 38 shots.